2 discs? That’s about 6 hrs of not funny. – He has a big hat. – A smart mouthed robot voiced by Joan Rivers constantly makes jokes about her ‘oil needing changing’. – Pizza the Hut is made entirely of pizza. Again, if you are laughing and clutching your suddenly splitting sides, then by all means proceed. Just know it will be without me. This is lowest common denominator stuff, the lazy precursor to equally inferior Date Movie / Scary Movie dross that infect video store shelves, waiting to violate the innocent and unsuspecting with their pathetic attempts at ‘comedy’. The only decent moments were when a character momentarily went ‘offscreen’, and when John Hurt cameod to parody his own role in Alien – with the fact John Hurt was willing to lampoon himself overwhelmingly more amusing than the crappy joke they opted for. I remember a school camp in my youth where this film was played on the bus. I laughed. We all laughed. We were all about 12. I am not 12 now. I resent 12 year old me for being dumb enough to find this worthwhile even once. Final Rating – 5 / 10. 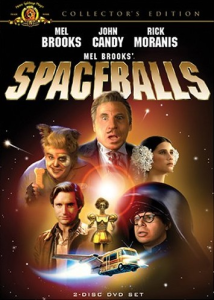 By the way, Spaceballs is equally terrible as a parody title as it is a parody film.